SUBMARINE SAFETY – An Insolvable Problem? Must submarines, by their very nature, always be death traps for the men who operate them? No successful rescue device has yet been developed which can be depended on infallibly in all circumstances, and recent losses of life indicate that the problem of safety is no nearer solution now than it was 20 years ago. THE recent tragic sinking of the British submarine M 2, with a loss of 62 lives, brings to the fore again the old problem of submarine safety. Following disasters such as the M 2, and the loss of the American S-4 and S-51, with their appalling cost in human life, inventors have been prolific in producing ideas intended to prevent recurrence of such tragedies. Yet not one of these ideas has solved the problem—at best, they have merely palliated it. The M 2 was a submarine of the latest type. 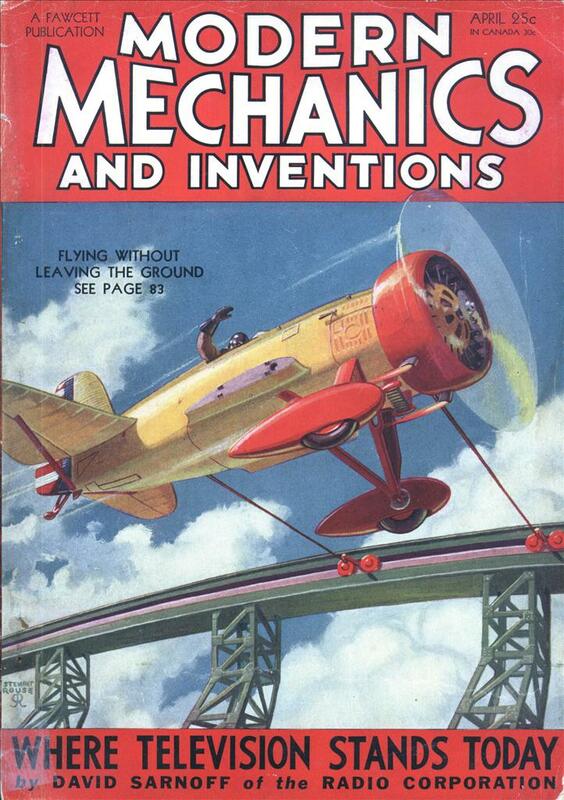 It was designed to carry an airplane in its decks, and as the first of its type was played up in the pages of Modern Mechanics and Inventions an issue or so ago. Its men were equipped with the official Davis Submarine Escape Apparatus—a mechanical lung which was supposed to enable the men to rise to the surface, breathing a supply of artificial air, in case of trouble. Not a man escaped. In an emergency the lung failed them. Perhaps the escape locks were blocked; perhaps the compressed-air apparatus, on which their escape to an ex- tent depended, did not function. No one really knows. The Momsen escape lung, used by the United States Navy, is very similar to the Davis apparatus. 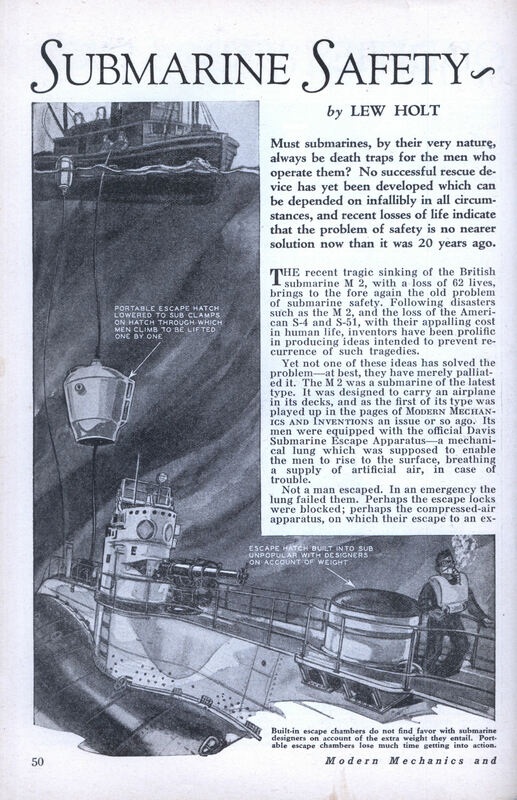 In addition, our government has experimented with escape chambers built in as part of the submarine, through which men can emerge when wearing the lung, and with a portable escape chamber, to be lowered from a ship above the stranded submarine, clamped to an escape hatch where the men can climb into, it, and then lifted up to the surface—very much like an under-water elevator. Designers object to the built-in escape chamber on the grounds that it adds excessively to the weight of the submarine. An under-water vessel must be perfectly balanced, so if an escape lock is added to the forward portion of the ship, an equal weight must be established to counterbalance it at the rear. A submarine is regarded as a stripped-to-the-bone war weapon, and attachments which hamper its efficiency are frowned upon by naval men. The portable escape chamber is satisfactory under ideal conditions, but it cannot be used until the stranded submarine is located. It would have been useless in the case of the M 2, whose location on the sea bottom was not known until several days had elapsed and the men had drowned. To locate stranded submarines, devices such as that illustrated on page 54, in which a coiled flexible cable attached to a buoy is fastened to the submarine’s side, to be released and floated to the surface in case of danger, have been frequently suggested. Through the tube air could be pumped to keep the men inside the sub alive. The position of the buoy on the water’s surface would mark the spot where the ship sank, and speed the work of rescue. Admitting that this idea is practical, Navy men nevertheless do not look with favor on it, claiming that depth bombs would set the device loose, betraying the submarine’s location to the enemy in case of war. Italians make use of a modified escape-chamber, as illustrated on page 54. It consists essentially of a tube within the hull of the submarine, pointed up through the deck. Into this tube a man enters, wearing a mechanical lung. Compressed air is admitted until outside water pressure is equalled, and he is shot out into the sea, to emerge at the surface or to enter a similar tube on a rescue sub lying alongside. The job of raising a sunken submarine is entirely divorced from the problem of saving its occupants. The pontoon system, in which huge metal cylinders are sunk beside the vessel, attached to it, and then blown out with compressed air, floating the sub, is still the favored method. An improvement in this method, however, has recently been suggested by Jesse W. Reno, whose success in salvaging sunken vessels entitles his4 system to serious consideration. Mr. Reno makes use of vertical pontoons instead of the usual horizontal type. They are open at the lower end and have constant lifting power. A few years ago he demonstrated their efficiency in a mid-winter salvage of the 500-ton coast guard cutter Scally, which sank in Long Island Sound to a depth of 65 feet. Although operating from an ordinary derrick lighter, and through one foot of solid ice, Reno succeeded in re-floating the Scally, a feat widely reviewed in the press. The Simon Lake expedition to recover treasure from the Lusitania, described in our February issue, is a less ambitious proposal than Mr. Reno’s plan, advanced some time ago, to raise the entire vessel. Now, with the Cunard Company abandoning its plans for the construction of a gigantic super-liner, owing to financial difficulties, Capt. Reno renews his suggestion that the Lusitania be raised from her bed, instead of being merely stripped of her treasure. On a rough estimate, 100 pontoons, each with a lifting strength of 200 tons, would be sufficient to raise the Lusitania; thus a salvor would have at his command about 20,000 tons to lift a deadweight of 15,000 to 18,000 tons of submerged ship. (The Lusitania’s displacement is about 31,000 tons.) At $4000 each, the cost of the pontoons would amount to $400,000. Miscellaneous equipment would add another $100,000. Hence, for an initial outlay of about $500,000 the Lusitania could be floated, towed and anchored in a safe harbor. The method he proposes for the Lusitania is a modification of the one employed to raise the coast guard cutter Scally. “To raise a ship of any size I employ two sets of pontoons, one attached directly to the ship portholes and the other at the surface. Thus, with a wreck as big as the Lusitania, I would attach about 92 pontoons directly to the hull—48 on each side of the ship—and keep eight stabilizing pontoons near the surface. By this method the lower set of pontoons is made to bear about 90 per cent of the load, which is not quite enough to raise the wreck. I served on a diesel sub in the mid 60s, and we had an emergency buoy in the forward deck. When we were dispatched to the far east for duty, it was welded to the deck with steel straps. That kind of gave me the creeps. But then, most of the ocean is too deep for rescue anyway. 2. The rescue device shown descending to the sub in the picture looks a lot like the McCann Rescue Chamber which was successfully used to rescue most of the crew from the U. S. S. Squalus which sank on one of it’s shake-down trials in a little over 300 ft of water off the New England coast in 1938 (I believe that was the time). The McCann differed from the one shown in that it could raise 8 crewmen at a time from a sunken sub. There were also 2 operators in the device making its capacity 10 men as opposed to the one man at a time described for the device in the caption of that picture. I was a 5 year old child at the time of the Squalus accident and I vividly remember my mom telling me after hearing the news on the radio that a submarine had sunk. I also recall being puzzled by that and quite clearly remember replying to her “Aren’t they supposed to sink?” many years and a world war later I read the story of the sinking of that sub while in high school and being fascinated by the effort to rescue the men trapped inside. I don’t recall the name of that book but there is a much newer account of it written just a few years ago entitled “The Terrible Hours”. rick: I really enjoy your insights from your childhood during the 30’s and 40’s. Could that book have been “Men under the sea” By Edward Ellsberg? It was written in 1939 but wasn’t entirely about the Squalus. Glad to hear you enjoy my posts. I have indeed read the Ellsberg book (quite a long time ago) but that’s not the one I referred to. I wish I could remember it. If I recall correctly, it was written by a journalist who covered the disaster and was very comprehensive since it was contemporary with the actual occurrence and it also covered the problems in salvaging the Squalus in great detail after the rescue. But the latest book, “The Terrible Hours” is very well written and pretty much covers the same material. AHA!! A little searching in Google found it! It was “Blow all Ballast”, by Nat Barrows (1940). It’s long out of print of course and our local library does not carry it. If you manage to locate a copy and are interested in that rescue, it’s well worth the read. Hmm. 10 bucks plus shipping isn’t bad. I’m kind of tempted to get it just for old time’s sake!